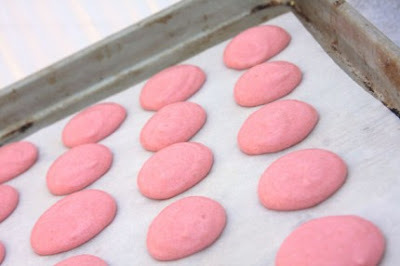 Juneberry Lane: Tutorial Tuesday: French Macarons . . . So apparently, if you haven't been paying attention, French Macarons (or Macaroons as we here in America know them) are being lauded as the 'new cupcakes'. And who can doubt why? They are delicate, beautiful to look at, and most importantly, these fiesty little bites of deliciousness play a mean game of hard to get. 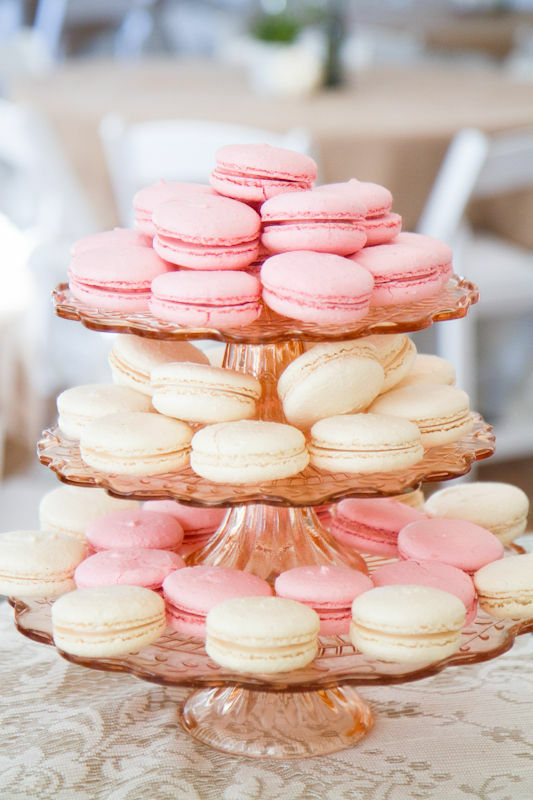 For as any of you know who have marched bravely into the kitchen in hopes of tackling the somewhat daunting task of making the perfect Macaron, the planning ahead, the timing, and even the weather can effect the outcome of your sweet treats. So this tutorial Tuesday, and with the help of NYC cooking instructor, Gail Monaghan, Martha Stewart, & mostly AmberLee of The Giver's Log, we are going to get to the bottom of this once and for all. ~ 3/4 cup almond flour, 2.5 oz. **Choose a nice, cool, dry day to make these. Humidity is not your friend. 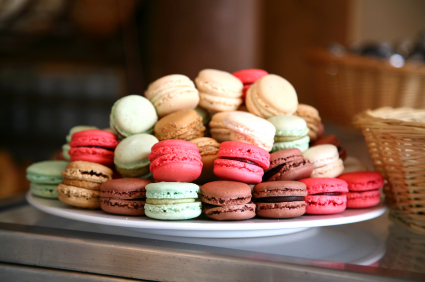 Because whipped whites are mostly air, if the air is too moist it can flatten your macarons. A hot kitchen can also deflate whites. Seperate your eggs in advance. Eggs are easier to separate when they’re cold, so seperate them at least an hour and up to a day before, then cover with plastic wrap so it touches the surface of the egg, and just leave the whites on the counter. **Have everything you need in place so you don’t have anything to slow you down once your eggs are whipped. 2. Whisk whites with a mixer on medium speed until foamy. Add cream of tartar, and whisk until soft peaks form. Reduce speed to low, then add superfine sugar. 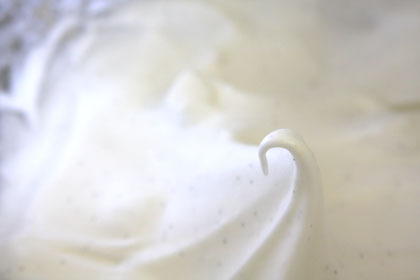 Increase speed to high, and whisk until stiff peaks form (3 to 5 minutes). If you’re going to add color, do so near the end of your whipping. 3. Sift flour mixture over whites, and fold until mixture is smooth and shiny. The amount of folding is crucial. Fold too little, and your macaron shells will have peaks instead of nice rounded caps. Fold too much, and your meringue will drip into a mess of wafer-thin blobs. Tartlette recommends about 50 folds, until your batter has a magma-like flow. About 65 folds should be just right. The batter will have a little of a soft-toffee like sheen when it is ready. You can test a dab on a plate, and if a small beak remains, turn the batter a couple times more. If the batter forms a round cap but doesn’t run, it is just right. When spooning the batter into the pastry bag, the perfect batter will start to just ooze out of the tip once the bag is full. If it stays stiff inside the bag it is too stiff, if it drips out too fast the batter is too runny. 4. Transfer batter to a pastry bag fitted with a 1/2-inch plain round tip. 5. Pipe 3/4-inch rounds 1 inch apart on parchment-lined baking sheets. 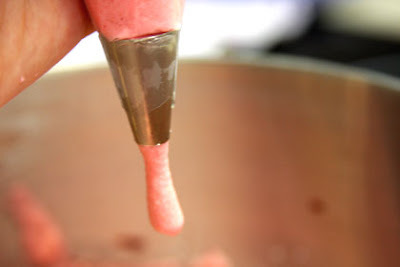 Put the tip right in the middle of where you want each macaron and let the batter billow up around it, then drag the tip to the side of the round. (You can pipe 1-inch to 2-inch rounds, but you will need to add cooking time). Tap bottom of each sheet on work surface to release trapped air. Let stand at room temperature for 30 minutes. (Different recipes recommend anywhere from no rest time to 2 hours rest time, but 30 to 45 minutes rest time should be fine, once the caps look more dull and have formed a slight crust.) While they’re resting, preheat oven to 375 degrees. 6. Reduce oven temperature to 325 degrees. Bake 1 sheet at a time, rotating halfway through, until macarons are crisp and firm, about 10 minutes. After each batch, increase oven temperature to 375 degrees, heat for 5 minutes, then reduce to 325 degrees. Every oven is different, so you may need to play with your oven temperature. The tops of the macaron shells should not brown. 7. 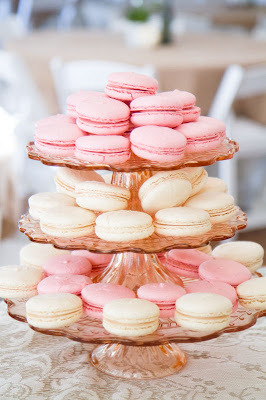 Let macarons cool on sheets for 2 to 3 minutes, then transfer to a wire rack. If macarons stick, spray water underneath parchment on hot sheet. 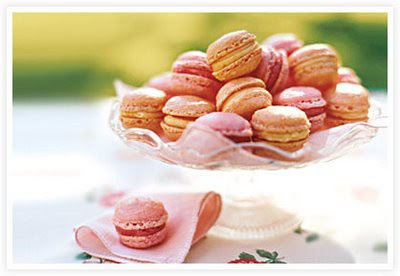 The steam will help release macarons. 8. Sandwich 2 same-size macarons with 1 teaspoon jam. Serve immediately, or stack between layers of parchment, wrap in plastic, and freeze for up to 3 months. It takes only 30 minutes out of the freezer for macarons to be ready to serve. If you’re wringing your hands in frustration because you can’t get these little desserts to come out right, you are in good company. Here are a few things you can try to get that first perfect batch that will get you addicted to making macarons. 1. Oven thermometer: Chances are, your oven is different than mine, which is different from many other friends and bloggers who have attempted macarons. Put down the few dollars it costs for a decent oven thermometer and you can know for certain that your oven temp is right. 2. 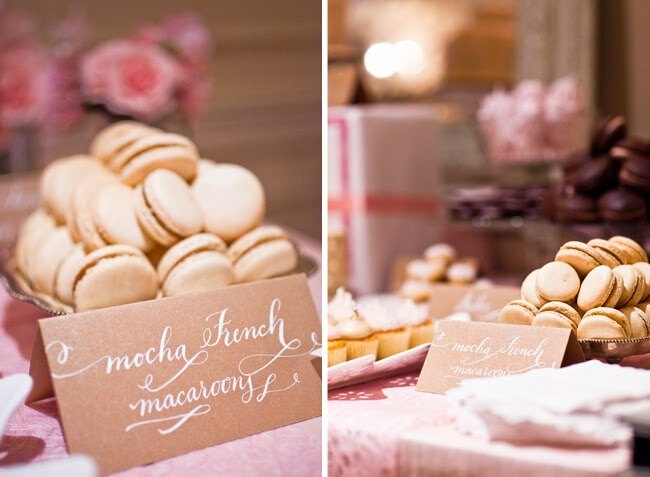 A good baking sheet: If your baking sheet is too thin, the macarons won’t bake evenly or correctly. You can even try doubling up two thin baking sheets if that’s all you have. 3. Use old eggs: I know this may sound wrong in our world of refrigerating everything, but it makes a difference. Use eggs that are not too fresh and leave them on the counter at room temp for a day or two. And how about cake pops? 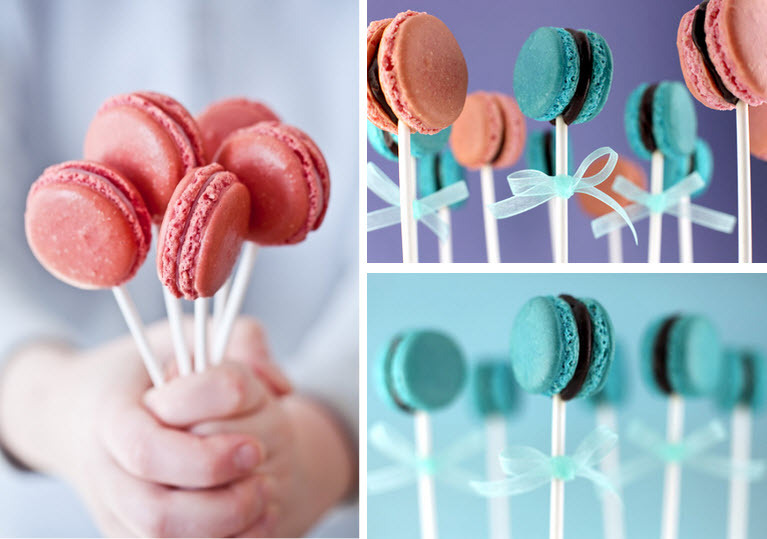 For a wonderful tutorial on how to make these delicious pops, visit Bakerella, of course . 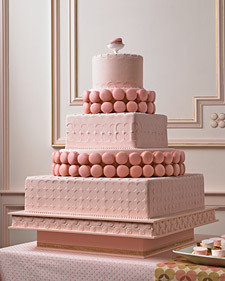 . .
Or even a wedding cake . 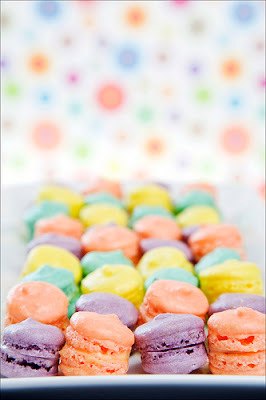 . .
Hope this little tutorial has given you the inspiration to gather your courage & get to baking! Bonne Chance & Bon Soir! I just stumbled across this post. Please don't delete it! I'm going to try my hand at macarons very soon and I found your instructions very easy to understand! Thanks! About how many macaroons does this recipe make? Striped Straws: A Retro Riot . . .
Tutorial Tuesday: Cherry Pie Cupcakes . . . Bonus Tutorial: Yarn Pom Garland & Flowers . . .
Fantastique Colorful Poms . . . Bonus Tutorial: Chocolate Covered Oreos . . . Gender Reveal Invitations & Favor Labels . . .
Juneberry Baby: Gender Reveal Party!